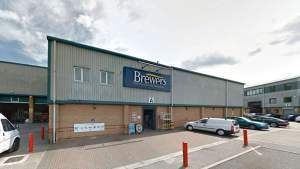 Basildon Brewers Decorator Centre is near Laindon train station, just west of Basildon town centre. You can see us from High Road, but you’ll need to turn off onto Durham Road, take a left onto Denbigh Road and then left again onto Wrexham Road to reach us. When you get here, there’s customer parking outside and the branch is wheelchair-accessible. Our branch is extremely popular with local tradespeople and retail buyers alike. They come for two reasons: our huge product range and the knowledgeable, personal service our team provides. We carry a selection of wallcoverings, with pattern books featuring hundreds of fabric designs, and stock numerous trade and designer paints, plus other decorating products and tools. If you can’t find what you need in stock, we can order products in for you to collect in store or we can deliver to you in the local area.